I wasn’t going to bother entering Golden Demon this year, Voodooworx and real life had been keeping me busy so didn’t have much time to plan or do anything. I got chatting with a friend of mine one evening and afterwards I decided that I should try and enter something or I would just spend the whole day kicking myself. It was only two weeks until the competition which didn’t leave me a huge amount of time at all. So I decided to focus on a single miniature, there wasn’t really enough time to do anything like a Squad or Regiment. After looking on the Games Workshop website for some ideas I decided on a Space Marine, deciding what chapter was the easy part for me as I am a die hard Space Wolves fan. 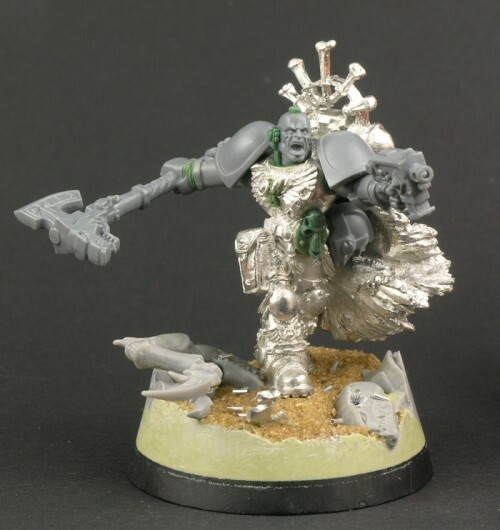 I came up with the idea to use the Kor’Sarro miniature leader of White Scars Chapter as a base for the conversion. A lot of the details on Kor’Sarro, like the wolf pelt on the backpack and the trophy teeth on his armour lend themselves really well to a Space Wolf. 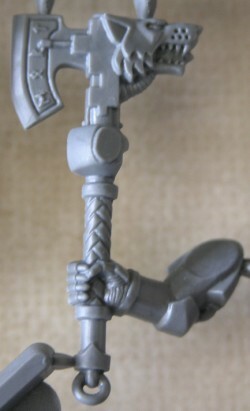 I didn’t want to use the head and arms from the Kor’Sarro miniature, so looking through the piles of Space Wolf sprues I have lying around I settled on a bolt pistol arm for his left arm and power axe arm from the Space Wolf boxset for his right. The axe had two hands on it, but that was easily be removed.